This is the site of a series of special Shinto rituals to honor and pass on the tradition of ancient salt making. 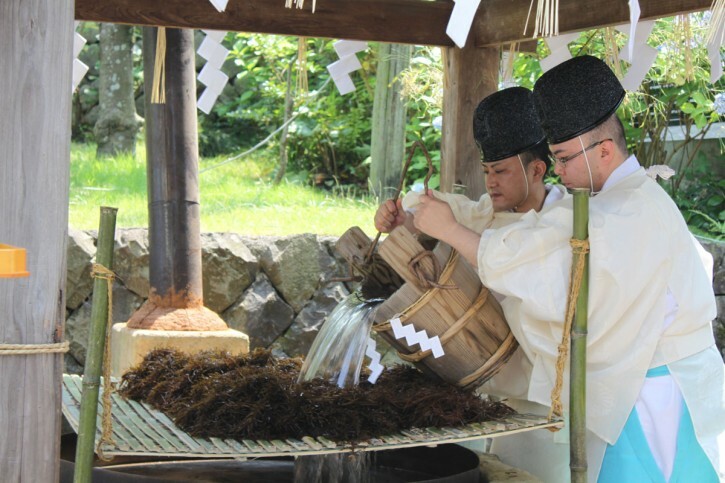 It begins with cutting and harvesting seaweed on July 4th (Moshio yaki shinji), drawing water at high tide, and pouring them into Kamigama yotsunokuchi (Mizukae Shinji) on the 5th. Then, coarse salt is collected from the boiled water in a flat pot on the 6th. While some details may have changed over the years, the essence of the ritual and its ancient rites is both culturally and historically valuable. Designated on August 17th, 54th year of Showa (1979).